Broadband - Data transmission scheme that sends multiple pieces of data over a single medium. often refers to high-speed data transfer speeds when benchmarked with dial-up. FCC defines (2004) broadband speeds to be upstream/downstream data flow of a minimum of 200 kbps. BPL - Broadband over Power Line, an emerging technology that utilizes existing medium voltage to transport data at broadband speeds. Byte - consists of 8 bits and can convey 256 separate characters. A million bytes per second is Mbps. cable Modem - A new popular high-speed (2 Mbps or less) that utilizes two-way cable TV systems. Most installed cable TV systems in the past two decades were one-way. 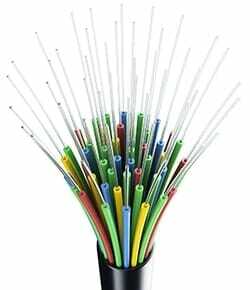 Dark Fiber - A fiber optic cable that is installed but does not have the laser installed to "light" the fiber. It is either spare or leased to entities that intend to install the electronics. Dialup - using a computer, modem, and a standard telephone line to connect to another computer, network, or Internet service Provider. Dialup provides "narrowband" data transfer rates. The fastest dialup modem offers a speed of 56 Kbps, although line speeds may be slower than what a modem is capable of handling. DSL - Digital subscriber Line, A telecommunications hi􀀫h-speed (128 kbps or more) offering that is popular in urban areas for users within three miles of a provider's central office. E-rate - A federally funded program to provide subsidies to schools and libraries in economically depressed and rural areas. subsidies are used to help pay for the development of information technology-related services. It can provide between 20 and 90 percent of the total cost of obtaining such commercial services. Ethernet - A process that allows the transmission of data at a rate of 10 Mbps over copper wires. Ethernet is generally used only in Local Area Networks (LANs) for connecting computers that are separated by a short physical distance. A network that uses Ethernet may or may not be connected to the Internet; Ethernet links do not automatically imply Internet connection. Hosting - A "Host" is a computer that houses data and software for another entity. For instance, the computer from which a web page is available is called the "host" or "web host" for that page. LATA - Local Access and Transport Area. These are 􀀔eographical boundaries established to identify where local telephone service begins and ends. when a signal crosses a LATA line, it is considered an interLATA transmission, and as such falls under different rules (conventionally applied to "long distance carriers"). LATA lines originally were instrumental in determining where long distance carriers operated. Local Area Network (LAN) - A data network that is used to inter-connect a company's computer and data facilities, usually within a single building or localized area. Open Access Network - Open access networks own the infrastructure and lease capacity to any and all providers who want to sell their prod-ucts and services over the network. This in return levels the playing field for all service providers to compete giving the consumer better choices with more capacity at lower prices. POP - Points of Presence are physical connections where the local service provider joins a long distance carrier. Proximity to a POP can reduce mileage sensitive charges for accessing long distance service or data transmission. T-1 - Bell system introduced the T carrier system, which digitized voice into 24 channels, in the 1960's. This system allowed 4 wires to carry the information of 48 wires. The bandwidth of T-1 is defined at 1.544 Mbps. A voice channel was 64 Kbps. Units - Kilo (K), Mega (M), Giga (G), and Tera (T) represent thousand, million, billion and trillion. Pecta (P) is quadrillion. Universal service Fund (USF) - The financial support mechanisms (tax collected through telephone bills) that constitute a universal fund which helps to compensate telephone companies or other communications entities for providing access to telecommunications services at reasonable and affordable rates throughout the country. VOD - Video on Demand, a technology or service using broadband that allows a video feed to be called upon near instantaneously for viewing. VOIP - Voice over internet Protocol, a technology that allows for carrier grade voice communication to occur over a broadband connection. By using the internet, VOIP offerings typically are a fixed monthly fee for unlimited local and long distance services. Wide Area Network (WAN) - A data network that is used to interconnect a company's remote data sites, or widely-dispersed computer equipment.